WELCOME to Harrogate, and welcome to the summer. 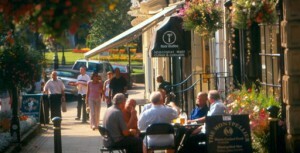 With it brings it joys and certain key elements, which make it one of the richest towns to live in Britain. The elderly generation dominates the morning of this town. While the straight haired macho boys and the fundamentally beautiful girls trotter of to school up the long roads, this particular elder generation are enjoying a cup of tea at Betty’s Tearoom. They sip over a cup of warm tea, in the welcoming place, from above looking on to green grass and idyllic flowers. The cafe windows also look onto the builders working on a pavement, looking bruised and bashed in the baking conditions. Those elderly, posh looking people inside, look down with a slight frown on their faces at those people that work hard. The main working contingent are in the office in their gleaming suits, and ready to secure appointments over cups of coffee with a mobile in hand, and a straight pen on the other hand. The generation is replaced at Lunch. In come the street entertainers of this town, with its assortment of bakery treats proving to be irresistible for the general public. The younger generation starts to creep in, slowly but surely. Come the afternoon, and adolescent activity is taking place and Stray Shenanigans. The close knit grips start to form as the atmosphere hots up. Come the evening, and we see the scene move to the clubs which prosper down one end way in Harrogate. These rich looking clubs have the merciless Bouncers on their front doorstep. Speaking in thick strong Yorkshire accents, their job is to abide by British law. They stand firm and straight like they rule the roost. The young short skirt ladies and straight haired open collar men desperately plough their way into these loose and seemingly, somewhat paranoid places. There are also free and where the atmosphere has cranked onto another level. Meanwhile, the open green territory of the Stray becomes the place for the young who feel free in the open land. The local hill starts to swelter with the adults sitting outside in the lush chairs on the clean, tidy looking pavements. Cigarettes light and conversations flow through of personal talk about those days events of their lives. It is a different light up near McDonald’s. The young boyhood racers, so eager to impress, enjoy a version of football on the street with the gap between the two pillars, a goal. The post office becomes natural for rebounds. Those fast moving adults that flow through this scene become bewildered uncomfortably by the live surroundings. Footballs become ping-pongs, from the bank to the window, and to the travel agency. The cars beep loud with the plastic cup of the adolescent drink for choice gurgling into the guzzled, live bodies, immobilized. online nursing degree Great site and post! consolidating student loans Great site and post!